Cozy studio apartment in central Vienna! The beautiful Vienna Jugendstil building is near Vienna's center. The vacation rental consists of one main room, a small kitchen, small entry room, a bathroom with tub and separate water toilet. 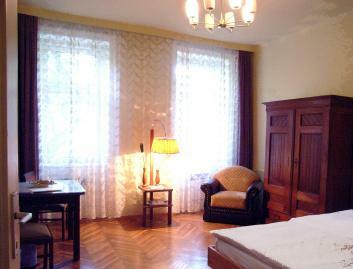 The studio apartment can be easily reached from the Vienna airport. The apartment in Vienna is ideal for a couple who like the comforts of home at an affordable price, on a comfortable convertible couch 2 additional persons are possible. The tub is spacious and you may relax after an eventful day in beautiful Vienna. Broadband Internet access to hook up your laptop included! No smoking in the apartment please!